Two Indian startups — one an e-commerce venture and the other a transportation solutions provider — are expecting to reap rich dividends from the Southeast Asian markets. While Zilingo is foraying into the fashion, lifestyle and beauty products market, Wings Travels Management is looking at exploiting the potential of the taxi aggregation market through a start-up mobile app called BookMyCab. The two companies are the only two from the services sector among six Indian firms that are participating in the four-day “Intermach and Subcon Thailand 2016” currently underway here. Zilingo is primarily operating in Singapore and Thailand with technical backup from an office in Bangalore. The company is into order management and inventory management services, pricing and cataloguing. “Basically we are trying to enhance the online shopping experience by creating a type of artificial intelligence,” Gupta said. Zilingo is now planning to enter the Indonesian market after Singapore and Thailand. Mumbai-based Wings Travels Management acquired start-up Livemind Technologies that developed the BookMyCab mobile app around two years ago and is now planning to become the first Indian taxi app to go global. For that, it is looking at Thailand as the springboard and the country’s second largest city, Chiang Mai, as the starting point. “We will be starting our operations in Chiang Mai within 15 days,” Ashok Bhandula, Wings Travels Management’s chief operating officer, said. “We see Chiang Mai as a big market because the cost of living is low,it is a huge tourist hub and is developing into a major business hub as well,” he said, adding that operations would be launched in Bangkok as well soon. In Chiang Mai, Wings Travels Managament is selecting a series of tourist destinations and is offering its customers the options of vans, sedans, SUVs and tuktuks. Wings Travels Management is also the first Indian company in its sector to enter the market in Myanmar, which has embraced democracy. The company provided consultancy service to set up a local taxi aggregating company called Hello Cabs in Yangon, which has 40,000 taxis. Inaugurating the “Intermach and Subcon Thailand 2016” on Wednesday, Thailand’s Minister of Industry Atchaka Sibunrang said that the event would help show her country’s readiness for being the region’s centre of high technology sophisticated industries. “This year’s event has the answers that the Thai industry needs,” Atachaka said. “It provides the opportunity for entrepreneurs to inspect the latest technology and innovation that can help enhance production efficiency, look for new business opportunities, adopt new innovation such as automation system, internet of things, electric appliances for increasing competitiveness and value addition for products,” she added. BNGALURU: BPO transport service provider Wings Travels has closed the acquisition of taxi aggregator Bookmycab for an undisclosed amount. The acquisition is part of Wings Travels' plan to strengthen its technology and expand business to 47 more cities in India, Myanmar, Thailand, Vietnam and Sri Lanka. The combined entity will be rebranded as Wings Bookmycab. 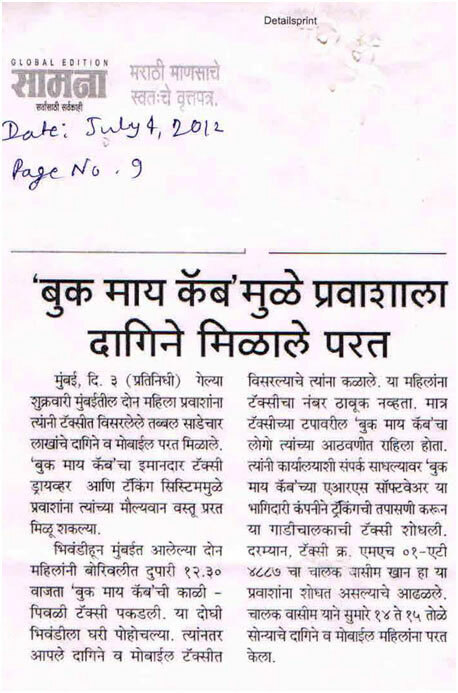 "We have merged synergies to create a global technology solution," said Arun Kharat, founder director of Wings Travels. "For the fast growing vehicle rental market, innovative technology reduces entry barriers for entering new geographies." In July last year, there were reports that Chandigarh-based aggregator Jugnoo has acquired Bookmycab but the deal actually did not go through. "This is to clarify that the deal with Jugnoo fell through at the last stage as it was linked to their Series-B fund raise, which got delayed," Bookmycab said in a statement. Wings Travel, which provides transport services to over 10 lakh employees of top multinational and Indian companies across nine cities, has been considering buying a technology company for developing its own mobile app, which would aid its expansion plans into retail and staff travel market, the statement said. "We were exploring a stake sale and were in talks with several potential buyers," said Avinash Gupta, founder of Bookmycab. "I am happy that we have found a profitably run, high growth company — Wings — as a partner. We are confident about the strong operational framework and vast experience of the new management." With this deal, two of the biggest investors in Bookmycab — YourNest Angel Fund and Contrarian Drishti Partners — have become the first external investors in Wings. "With this acquisition, we see an opportunity to play a positive role to build a significant billion-dollar tech-leveraged transportation company," said Sunil Goyal, CEO at YourNest Angel Fund. 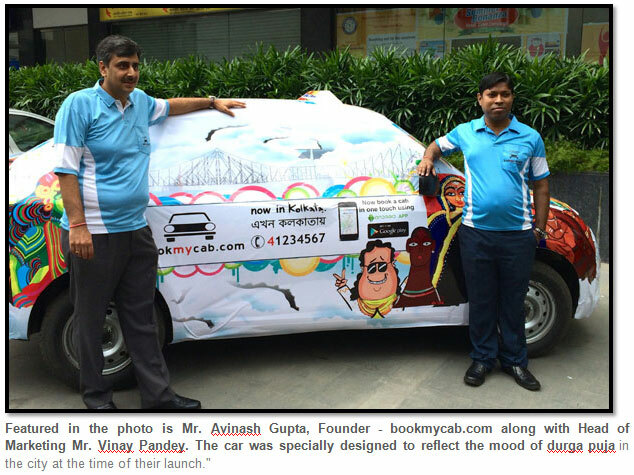 Bookmycab is backed by YourNest Angel Fund and Mumbai Angels. Pune­based Wings Travels wingstravels.in Management Pvt Ltd, which provides staff transportation services, has acquired taxi services company Bookmycab for an undisclosed amount. The acquisition will help Wings Travels expand into the radio taxi segment and strengthen its technological capabilities, founder Arun Kharat told Techcircle.in. The merged entity will be rebranded as WingsTravels Bookmycab. 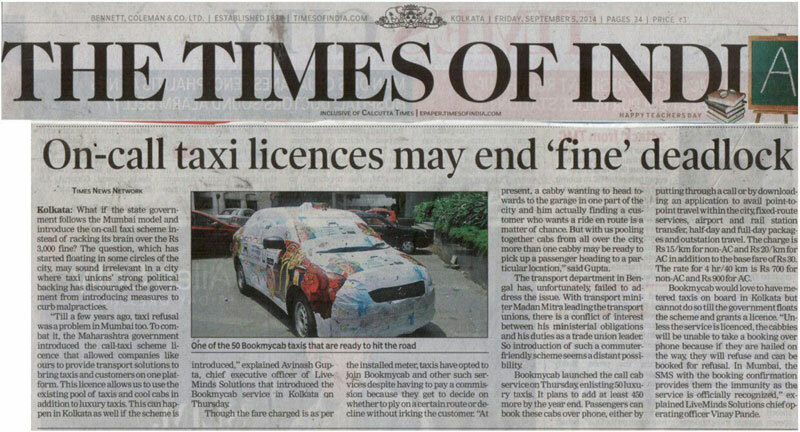 It will be run by Mumbai­ based LiveMinds Technologies Pvt Ltd, which owns Bookmycab, Kharat said. Kharat said a mobile app with the new name will be rolled out that will offer a host of services including inter­city transport under a single platform. Wings Travels, which has been operating since 2001, primarily offered staff transport services to business process outsourcing firms. It has about 600 employees and offers its services in Mumbai, Pune, Gurgaon, Bangalore, Hyderabad, Chennai, Nagpur, Chandigarh and Ahmedabad, among other cities. The acquisition will help Wings Travels to expand its services to 47 cities in India and offer its radio taxi services in Yangon (Myanmar), Chiang Mai (Thailand) and Vietnam. While its Yangon operations commenced about three months ago, the Thailand operations are likely to start from the first week of May. “We will expand to all the Indian cities that have airports and up our Southeast Asian play by the end of 2016,” said Kharat. As part of the transaction, Avinash Gupta, the founder of Bookmycab, will join the merged entity. However, it is not clear whether he will continue or exit at a later stage. Kharat refused to divulge any details on this. 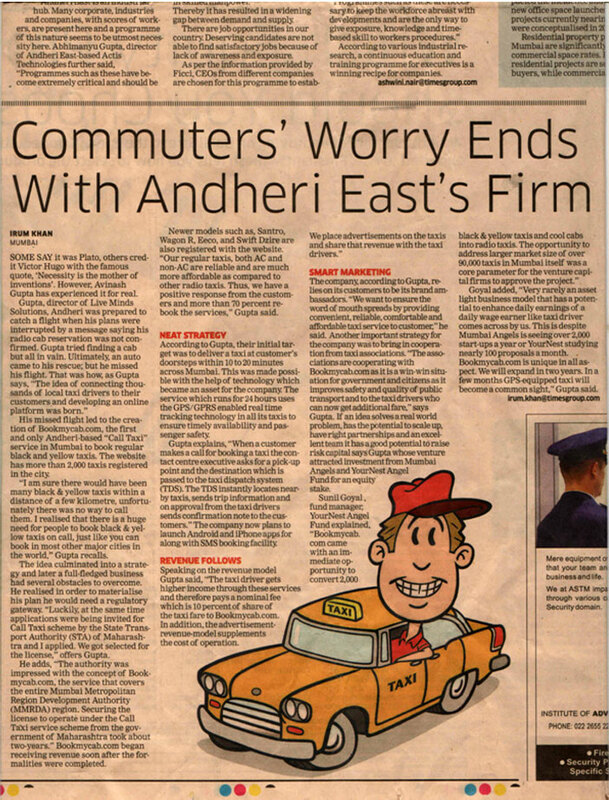 In July last year, reports of auto­rickshaw aggregator Jugnoo being in talks to acquire Bookmycab had made the rounds. But the deal didn’t go through. The Economic Times, which first reported the Wings­Bookmycab deal, said talks with Jugnoo fell through as the acquisition was linked to their Series B fund raiser that got delayed. Queries sent by Techcircle.in to Bookmycab, which is backed by YourNest Angel Fund and Mumbai Angels, didn’t elicit any response at the time of filing this report. Passengers will end up paying Rs 50 less for each taxi ride booked between 11 am and 6pm from Monday to Friday Mumbai, 21st November 2014: Bookmycab.com, the popular call cab services of Mumbai, has introduced ‘Happy Hours’, a discount scheme for taxi services within the city limits during non-peak traffic hours. The new discount offer makes taxi travel cheaper than even auto rickshaw rides. Considering the average trip distance is within 20 kms, Bookmycab.com is offering a base fare of Rs 11.50 per km or lower. The base fare of auto rickshaws in Mumbai is Rs 17. The discount offer will be valid till 20th Dec and would be applicable to all city travels within the distance of 20 kms between 11 am and 6 pm from Monday to Friday. Passengers can book taxis for any destination within the city by calling on the number 022-61234567 of Bookmycab.com’s 24-hour call centre, or logging on to the website or even using their mobile phones by downloading the user-friendly Android mobile app. The various in-city services offered Bookmycab.com include point-to-point travel within the city, fixed-route services, airport transfer and railway station transfers. Founded in 2012, Bookmycab.com has the distinction of being the first call cab service provider in India to introduce in Mumbai call taxi services for the ubiquitous ‘kali-peeli’ or black & yellow taxis and ‘Cool Cabs’ at normal metered fares. The services of Bookmycab.com today boasts of over 5000 registered cabs offering comfortable and affordable taxi travel in multiple cities across India, including Delhi, Kolkata and Hyderabad. The fleet comprises mostly new taxis of mid-range hatchback, MUVs and sedan cars, which ensures a comfortable ride for passengers. 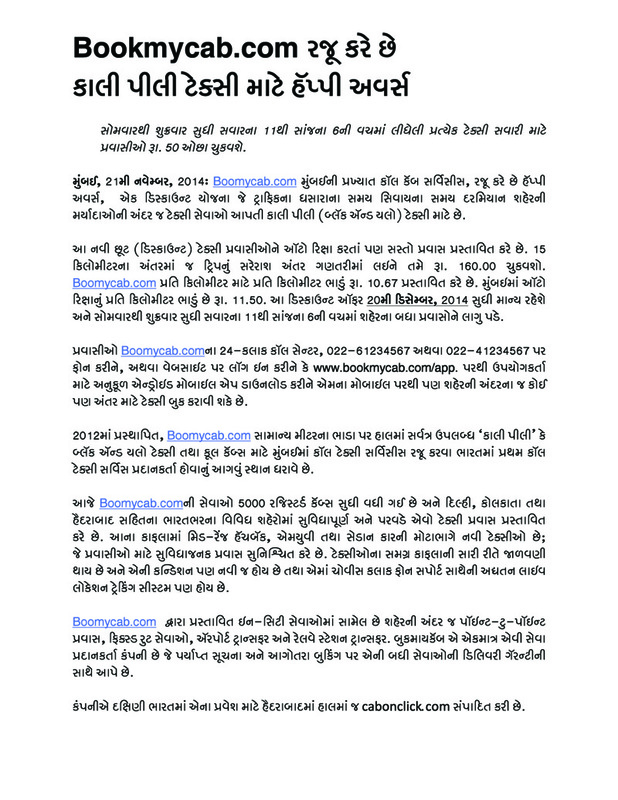 The company recently acquired cabonclick.com in Hyderabad to make its entry in Southern India. 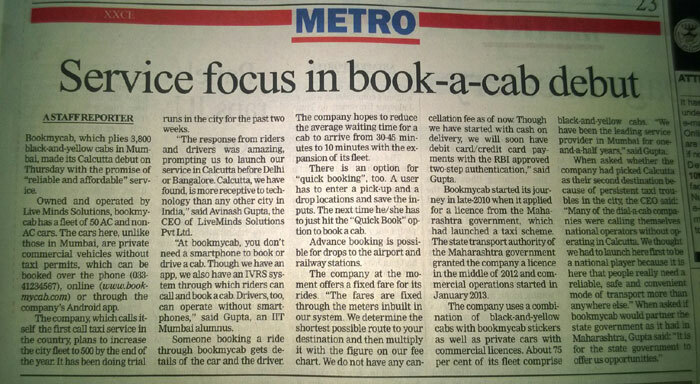 Bookmycab.com call taxi service is run by LiveMinds Solutions, an initiative of IIT Mumbai alumni. Bookmycab.com emphasizes upon reliability and affordability, customized service suiting customer requirement and, heightened customer service by devising systems, processes and technologies that deliver a reliable interface. - India's first M&A in online cab booking space. 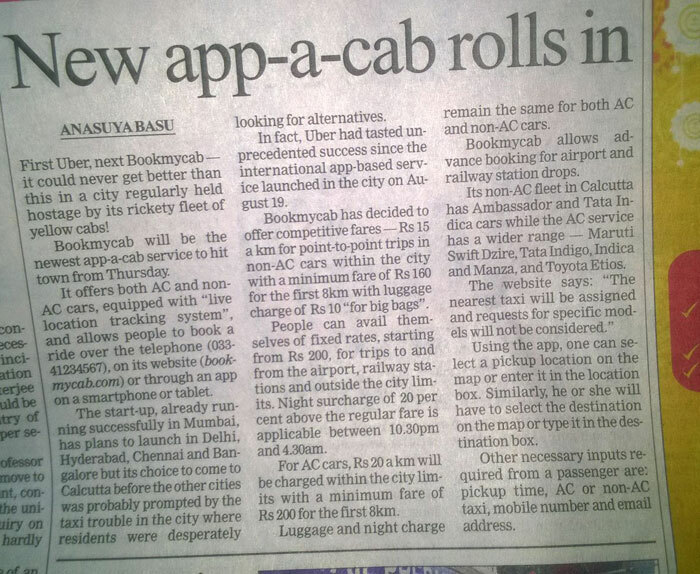 The acquisition gives Bookmycab access to over 150 cabs. - Move a part of Bookmycab's strategy to increase footprint in Southern markets after Western region (Mumbai) and Eastern region (Kolkata). - Company unveils new app customized to Hyderabad. Invests in a dedicated call center based out of the city. - Bookmycab announces a limited period offer for Hyderabad Customers – Airport Drop and Pick-up @ Rs 399 only. In one of India's first large ticket M&A in the online cab booking space, Mumbai's popular call taxi service 'Bookmycab.com' has acquired Hyderabad-based 'CABonCLICK.com' – an online taxi booking service provider in Hyderabad and parts of Telangana. This acquisition unveils a new trend of expansion in the hot e-com space adapted by market leaders. This move will give bookmycab.com, which enjoys 95% market share in Mumbai's non-A/C cab segment, a clear advantage over others to expand its call taxi services in the Cyber City. A move over unreliable and expensive taxi services, Bookmycab.com will roll out its large fleet of comfortable, reliable, efficient and cost-effective call taxis in Hyderabad. Post acquisition, CabonClick has moved on to the state-of-the-art technology platform of Bookmycab.com and its entire fleet has been integrated with the later. Founded in 2012, Bookmycab.com has the distinction of being the country's first call cab service to launch in Mumbai with over 95% market share today. The company launched its services in Kolkata in September 2014 and has witnessed a 200% growth in driver registrations within just 3 weeks of launch. This experience will give bookmycab a strategic advantage to offer passengers in Hyderabad a fantastic customer experience. Passengers will be able to hire cabs at the click of a button, anytime and from anywhere, through a mobile app, website or through a 24-hour dedicated call center at 040-60603030, All India Number 022-41234567, 02261234567. Bookmycab has announced an introductory offer of Rs 399 for Airport pick-up and drop from any location in Hyderabad. This offer will be vaild for fortnight and will be applicable for all customers on their first booking through the app. Use promo code HYD399 to avail this introductory offer. About the Hyderabad foray, Mr. Avinash Gupta, CEO of Bookmycab.com, said, "This M&A is a part of our overall strategy to roll out bookmycab across the country in 2014-15. CabOnClick.com and bookmycab.com have complimentary strengths and we are confident that consolidation is the way to grow strategically in the e-com space in India. We chose Hyderabad as the first market to enter Southern India due to the fantastic response during our test phase. 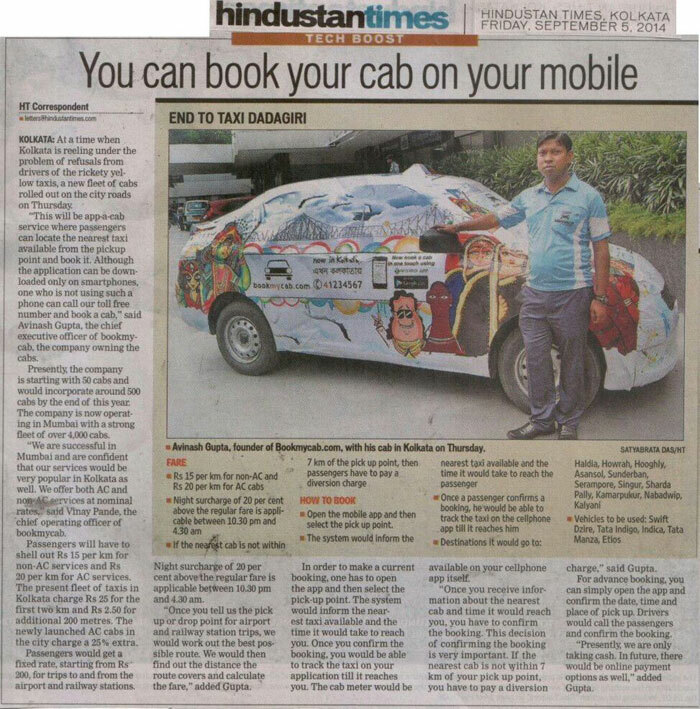 We are confident that passengers in Hyderabad will enjoy the seamless and convenient experience offered by us in Mumbai and Kolkata" Mr. Prateek Mahesh, Founder of cabonclick.com, said, "We are excited about the association with bookmycab.com. They are leaders in this segment and their expertise and experience across metros in India will offer a brilliant experience to subscribers of Hyderabad." The Bookmycab.com call taxi service is a win-win for taxi drivers, office goers, tourists, corporates, etc. - For passengers and corporate clients,it assures reliability of services in addition to billing transparency and control over costs for the later. The passenger mobile app will enable locating a nearby taxi and booking its services and also locating the taxi's current location from the pick-up point. - For taxi driverswho join the fleet of Bookmycab.com, it is an additional revenue stream and an assured measure to monetize their idle run. They have a greater choice of the routes they want to service and their on-road hours as there is no human intervention involved.Drivers will be able to know about the routes and passenger locations at the click of a button even if they don't own a Smartphone. Bookmycab.com call taxi service is run by LiveMinds Solutions, an initiative of IIT Mumbai alumni. Bookmycab.com emphasizes upon reliability and affordability, customized service suiting customer requirement and, heightened customer service by devising systems, processes and technologies that deliver a reliable interface. It is also one of the few providers who are equipped with real time tracking technology in all its taxis to ensure complete passenger safety. The customers will enjoy a special benefit for using the Durga Puja Package. They will be entitled to a 10% Cash Back in the form of Promo codes which can be used in subsequent trips within the month October 2014. 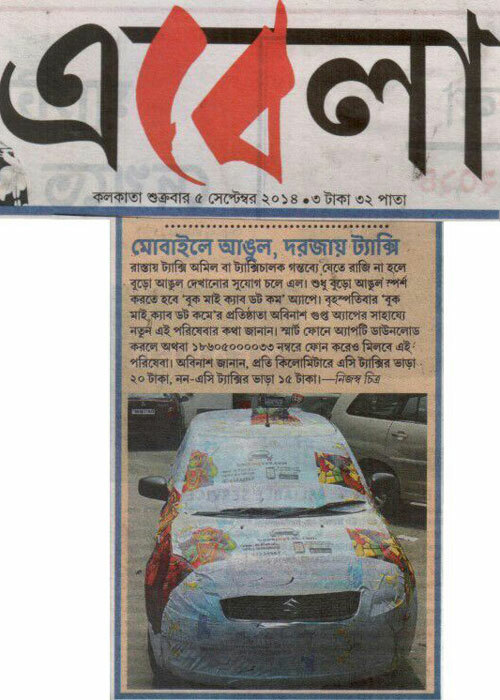 Speaking about the Kolkata foray, Mr. Avinash Gupta, CEO of Bookmycab.com said, "We are delighted by the fantastic response we have received in Kolkata. The number of cab drivers signed up with us has gone by 200% and we will continue to focus on introducing innovative products. 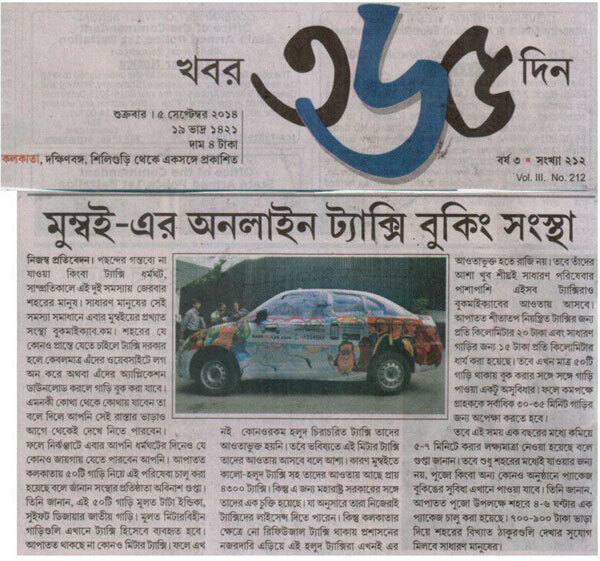 "Durga Puja" package is our gift to Kolkata for making pandal hopping fun and without any hassles of waiting for taxis. 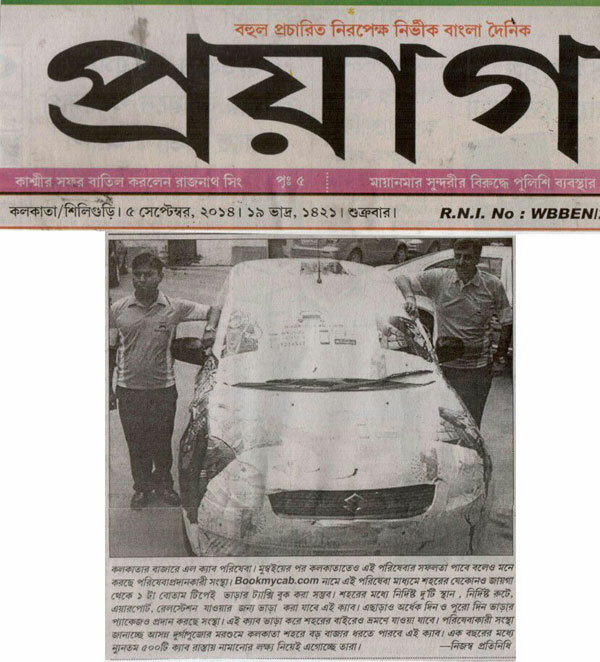 The idea came up during our discussion with customers in Kolkata who wished to gift a cab ride to their loved ones for pandal hopping." 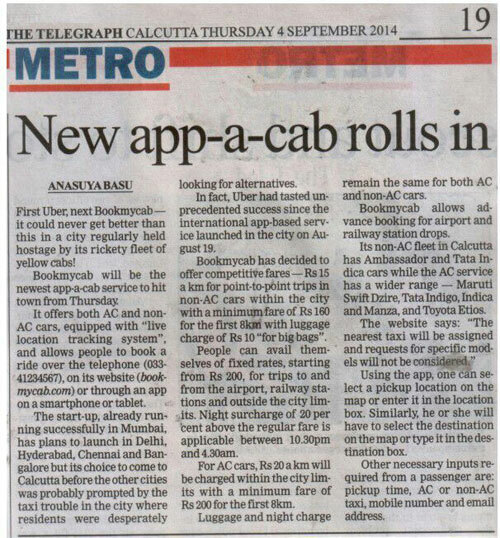 Bookmycab.com has introduced various services in Kolkata including local travel, i.e. point-to-point travel within the city, fixed-route services, airport transfer, railway station transfer, half-day and full day packages and outstation travel. The entire fleet of taxis are well maintained and in new condition and have been equipped with state-of-the-art live location tracking system with round-the clock phone support. 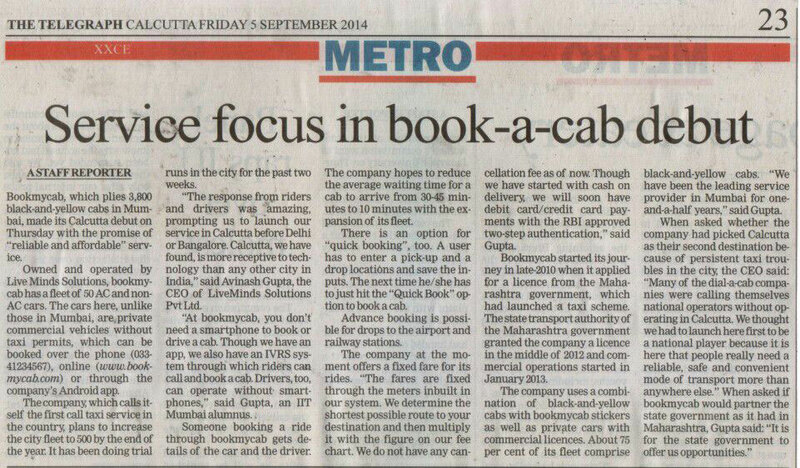 The Bookmycabservice is a win-win for all – right from the taxi drivers, to office goers, tourists, corporates, etc. For passengers and corporate clients, it assures reliability of services in addition to billing transparency and control over costs for the later. For taxi drivers who join the fleet of Bookmycab.com, it is an additional revenue stream and an assured measure to monetize their idle run. They have a greater choice of the routes they want to service and their on-road hours as there is no human intervention involved. Further, the Android-based mobile app of Bookmycab.com is an added benefit due to its user friendly and unique features, which enable taxi drivers to know about the routes and passenger locations at the click of a button even if they don’t own a smartphone. Similarly, the passenger mobile app not only enables locating a nearby taxi and booking its services but also locating taxi’s current location from his pick-up point. Passengers in Kolkata can book taxi services either by downloading bookmycab.com application from Google Play Store or logging on to our website Bookmycab.com or dialing 033-41234567. About Bookmycab.com: Bookmycab.com is revered as the first taxi service in India, to launch metered Black & Yellow (Non Air-Conditioned) Taxis as well as metered Cool Cab (Air conditioned) as call Taxis. 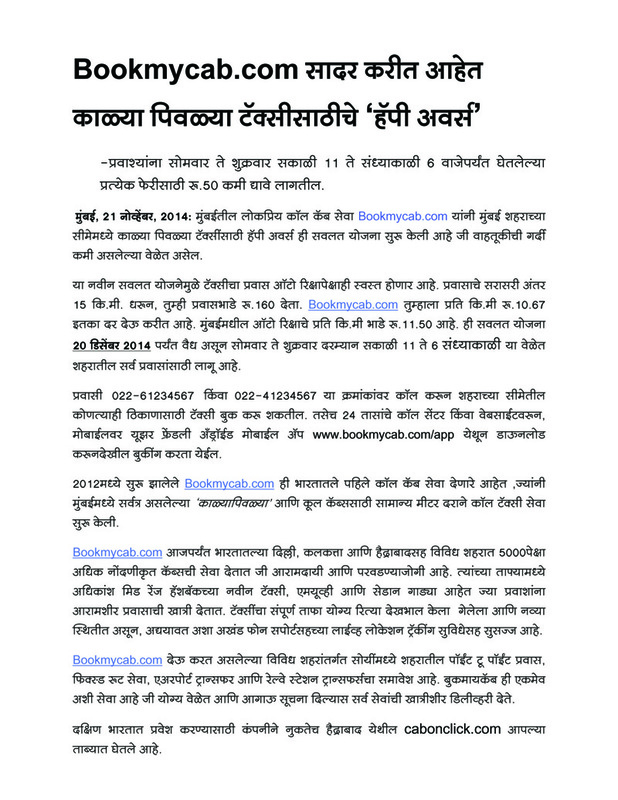 Bookmycab.com call taxi service is licensed by State Transport Authority, Maharashtra State Mumbai. Bookmycab.com call taxi service is run by LiveMinds Solutions, an initiative of IIT Mumbai alumni. Bookmycab.com emphasizes upon reliability and affordability, customized service suiting customer requirement and, heightened customer service by devising systems, processes and technologies that deliver a reliable interface. It is also one of the few providers who are equipped with real time tracking technology in all its taxis to ensure complete passenger safety. Bookmycab.com is revered as the first taxi service in India, to launch metered Black & Yellow (Non Air-Conditioned) Taxis as well as metered Cool Cab (Air conditioned) as call Taxis. Bookmycab.com call taxi service is licensed by State Transport Authority, Maharashtra State Mumbai. 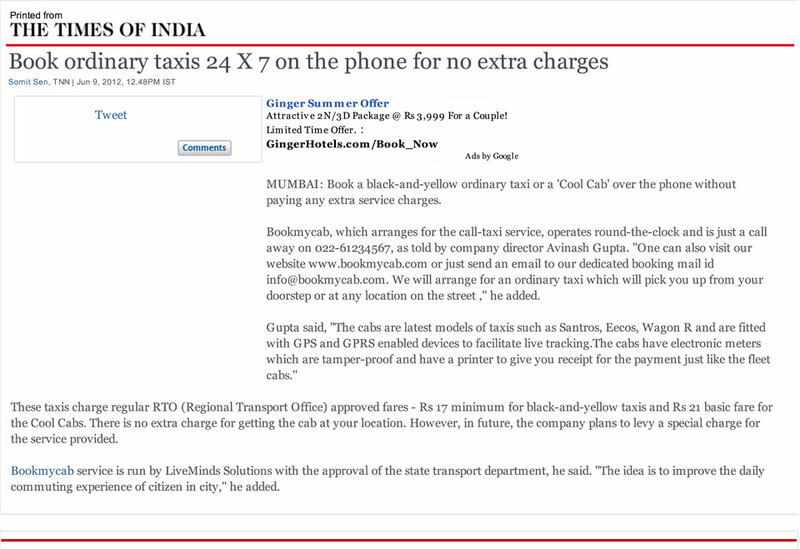 Bookmycab.com call taxi service is run by Live Minds Solutions, an initiative of IIT Mumbai alumni. Bookmycab.com emphasizes upon reliability and affordability, customized service suiting customer requirement and, heightened customer service by devising systems, processes and technologies that deliver a reliable interface. It is also one of the few providers who are equipped with real time tracking technology in all its taxis to ensure complete passenger safety.